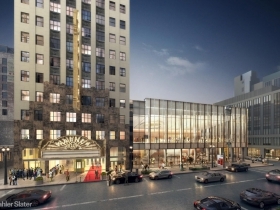 The Milwaukee Symphony Orchestra is moving forward on their $80 million plan to redevelop the Warner Grand Theatre into a new home for the symphony. Formal construction work is expected to start this month. Attorney Steve Chernof appeared before the Common Council’s Zoning, Neighborhoods & Development Committee representing the symphony Tuesday morning to secure approval of a three-way land swap that would facilitate the northward expansion of the 12-story theater building. 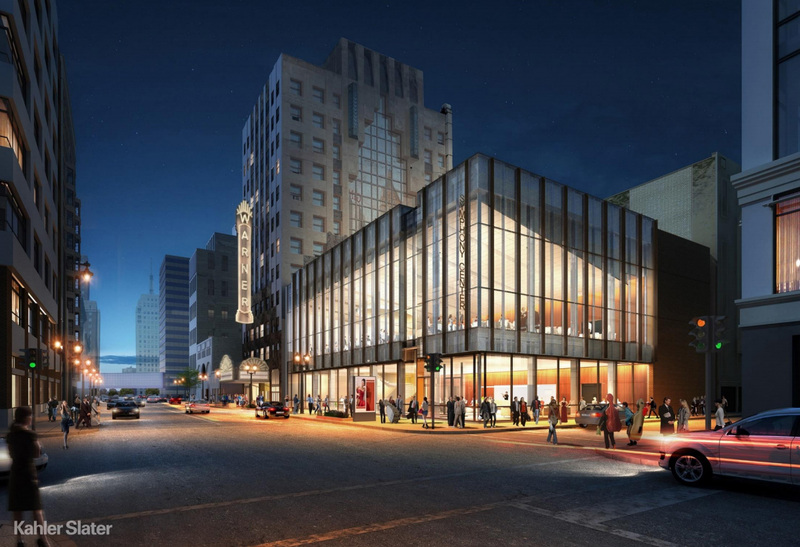 The symphony is redeveloping the theater in order to have more control over their performance schedule and revenue streams. The orchestra has shared the Marcus Center for the Performing Arts with a number of other tenants, including traveling Broadway shows, since it opened in 1969. 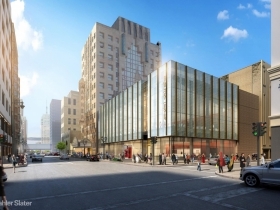 The rationale for the move was discussed in detail in this story by Urban Milwaukee. 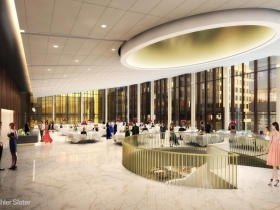 To accommodate the redevelopment, the city and symphony have orchestrated a musical chairs-style series of transactions to create the land necessary. 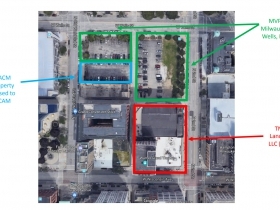 The Redevelopment Authority of the City of Milwaukee will sell a small parking lot at 738-744 N. Old World Third St. to Las Vegas parking lot real estate investment trust Bergmann Walls & Associates for $388,035. Bergman will join that property with their own at 746-752 N. Old World Third St. Bergman will then sell a portion of their properties at 215 W. Wells St. and 735 N. 2nd St. equal in size to the RACM property to the orchestra’s real estate affiliate. 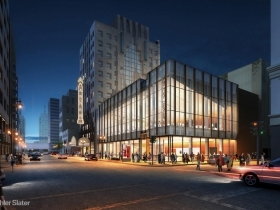 The Milwaukee Symphony Orchestra will then partner with a private operator to lease the Bergman lot. 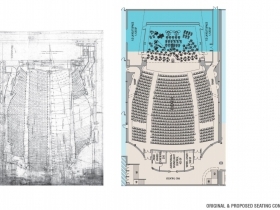 The end result will be the symphony getting the space it needs for its building, Bergman maintaining its lot and landing a new parking tenant, and the city getting a purchase option for the land it’s selling in the event it is not developed by 2025. Alderman Nik Kovac pushed Chernof to find a development proposal for the site sooner rather than later. Chernof told the committee that the symphony, through a contractor, intends to start construction on the project this month. The theater would open in 2020. Upper floors in the office tower portion would be sold to a private developer for potential office or housing uses. Vacant for nearly three decades, the building is now undergoing work on environmental abatement, said Chernof. Ald. Milele A. Coggs recommended the symphony find inclusive uses for the theater space on their off days. “I would urge you to think creatively about what those other performances could be, only because I know the average citizen isn’t going to the symphony,” said the alderwoman. The committee unanimously endorsed the land sale, which will next go before the full Common Council. 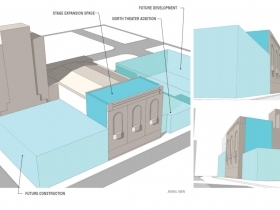 The council will soon consider resolutions to vacate a portion of N. 2nd St. and the alley at the rear of the site to facilitate the redevelopment. 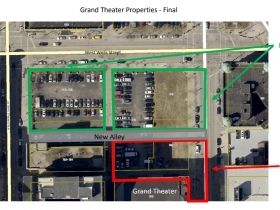 The east wall of the theater will be moved 35 feet east into N. 2nd St. to accommodate a larger stage. The project is funded in part with $16 million in federal and state historic preservation tax credits. However, those credits come with strings attached. “The National Parks Service wouldn’t allow us to deconstruct it and rebuild it; we have to literally move it,” said Chernof. He noted there are just two companies in the country that do this work, and the MSO has scheduled the move for October because the early fall month is the least windy. Department of City Development representative Dan Casanova told the committee a series of utilities in the street need to be relocated prior to the move. The symphony’s real estate affiliate TNSH LLC (“The New Symphony Hall”) has also acquired the building at 200-208 W. Wisconsin Ave. for $1,238,000. Kiku Japanese Restaurant at 202 W. Wisconsin Ave. has closed as a result of the acquisition. 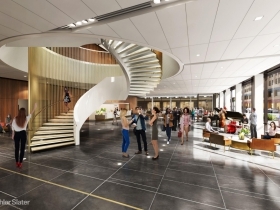 The two-story building will be transformed into a glassy front door for the theatre and will include food and beverage space for before- and after-show functions. Kahler Slater is leading the design on the project. The city previously approved granting the project $750,000 from a tax-incremental financing district. Sorry if I misunderstood but does this mean the permanent closing of N. 2nd? That new section at N. 2nd & Wisconsin will make an ideal downtown transit plaza to run the street car through if we do a north-south trunk between King Drive and S. 2nd. Then we can sell the lot at 4th and Wisconsin and let that be developed normally. IMO, that’s always been an odd location & out-of-scale design for a transit plaza. This one would be the right scale for streetcar/bus riders & transfers while closer to job centers/cultural amenities. I believe 2nd Street becomes one-way each way for street traffic for this one-block stretch. Exciting to see this move forward. Hoping it helps renewal of the old Grand Avenue move forward more quickly. Interesting to see the relatively new development of expanding the building north into those parking lots. (I first heard of that in the past two weeks.) Would love to see those lots developed as residential with ground floor retail. Even though I had been to this theater many times over the years ( I think it was the CENTRE TWINS back then) I didn’t remember how opulent that lobby was/is. Even in the 70’s and 80’s, you could see first run movies there like ALIEN, ESCAPE FROM ALCATRAZ, AMERICAN GRAFFITI etc., sometimes for $1 on Tuesdays (parking included on the lot behind it)! And that corner building on 2nd street–the one that appears to be all glass–that was a TACO BELL! What an upgrade this will be! 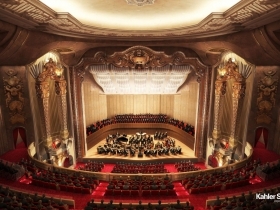 Everyone who enjoys the symphony will certainly be pleased with this new venue!